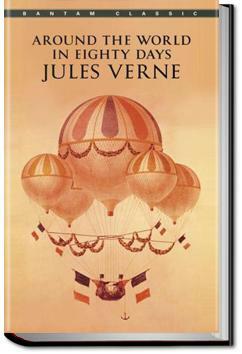 Around the World in Eighty Days (French: Le tour du monde en quatre-vingts jours) is a classic adventure novel by the French writer Jules Verne. Mysterious Phileas Fogg is a cool customer. A man of the most repetitious and punctual habit – with no apparent sense of adventure whatsoever – he gambles his considerable fortune that he can complete a journey around the world in just 80 days… immediately after a newspaper calculates the feat as just barely possible. With his excitable French manservant in tow, Fogg undertakes the exercise immediately, with no preparations, trusting that his traveling funds will make up for delays along the way. But unbeknownst to him, British police are desperately seeking to arrest him for the theft of a huge sum by someone who resembles him, and they will track him around the world, if necessary, to apprehend him. This is an adventure novel of the first water, with wholly unexpected perils, hair-breadth escapes, brilliant solutions to insoluble problems, and even a love story. And can this be? – That he returns to London just five minutes too late to win his wager and retain his fortune? . . .and at half-past four she hauled up at the quays of Bombay.